Please note this requires 64-bit version of Windows 7, 8/8.1, or 10. Please note we have limited amount of licenses available. Once they are gone, this giveaway will end. You need a creative partner, not just video editing software. With VEGAS ® Movie Studio as your collaborator, transform your digital photos and video clips into lasting memories. Easy-to- use editing tools, flashy titles and stunning video effects provide pure inspiration. Smart phones make it easy to make movies. And Movie Studio makes it even easier to make those movies stand out. Whether you’re a beginner or an experienced filmmaker, VEGAS Movie Studio offers all the tools and features you’ll need to import and edit movies, images, and music. With a streamlined workflow, powerful editing tools, and a vast array of video and audio effects, the art of moviemaking is right at your fingertips. Add titles, music, effects and transitions and correct image color and audio sounds. Movie Studio offers all the tools and features you’ll need, fast. Very basic video editor, nothing wrong with it but nothing more useful than any other video editor that has been offered here before, and you need to buy third party add-ons to do anything more with it, unlike other editors that have been offered here before. With improved camera technology in mobile devices, almost every individual likes recording precious moments of their lives as pictures and videos. These files can be shared over social networks and different websites, to be shared with friends and other people. You may be great at recording clips, but the multimedia files still lack that professional touch that you want them to have. There are a lot of video editing tools available for Windows, most of which are very expensive and too complex for regular users. Regular users always look for an application that can help them complete their tasks with as little trouble as possible. VEGAS Movie Studio 13 is a video editing software applications, designed to help any type of users to create and edit their videos, and to make them look sharp and professional. Using this application even novice users can make their homemade videos look better. The installer size is about 450MB, which might require a fast and stable internet connection to download. Once downloaded, the installation process is simple and straighforward, taking no time at all to complete. The application can be registered using the license key and entering your details when asked. Once done, you can start using the application to bring professional touch to your videos. The UI of the application is clean, easy to use, and follows the modern design that most other video editors have nowadays. When launching the application for the first time, a welcome window appears and provides you with a few options to get you started. You can choose to open a new project, open a recent one, take a look at the interactive tutorials, or just start using the application. At the top is the menu bar, with usual drop down menus. Under it, is the toolbar with important and usefull tools and options. The smaller box to right is for all the media you have imported to the project, Transitions, Video FX, and Media Generators. The one to the right is where you can preview your media and the project. To the bottom is the timeline, where you have different sections for audio, video, text, and music. There are a few buttons at the bottom, which allow you to Normalize, Fade, Delete, Crop, Add Effect, Trim, Split, and Auto Ripple. – Clean and Easy to use UI, designed to be suitable for all types of users. – Interactive tutorials to get you started with the application. – Advanced image stabilization to make videos smoother and improve the overall quality. – Add audio, video clips, text, and photos together to create a movie. – Offers a wide range of features and tools, that are suitable for users with basic to users with advanced level video editing skills. – Import media files of formats like AAC, AA3, AVI, BMP, MPEG-1, MPEG-2, MPEG-4, WMV, AIFF, FLAC, MP3, OGG, PCA, SND, W64, WAV, WMA, GIF, JPEG, PNG, WDP, CDA, and SFA. – Export projects to different formats like AVC/AAC, AVI, MPEG-2, MPEG-4, WMV, MOV, AVCHD, RM, MVC, XAVC S, AAC, AIFF, FLAC, LPEC, MP3, OGG, PCA, W64, WAV, WMA, BMP, JPEG, PNG, TIFF, WDP, WMPhoto, DDS, DPX, and EXR. – Audio and video effects to make your projects look more professional. – Fewer options than other simlarly priced applications. 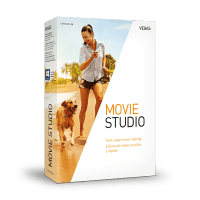 VEGAS Movie Studio 13 is a reliable and easy to use video editing that comes packed with many tools that’ll help you create professional looking projects and videos. It is easy to use, and comes with interactive tutorials to get you started with the application. The application runs smoothly without any lag or crashes, and system resource usage is low-to-moderate during the run. It is definitely recommended.